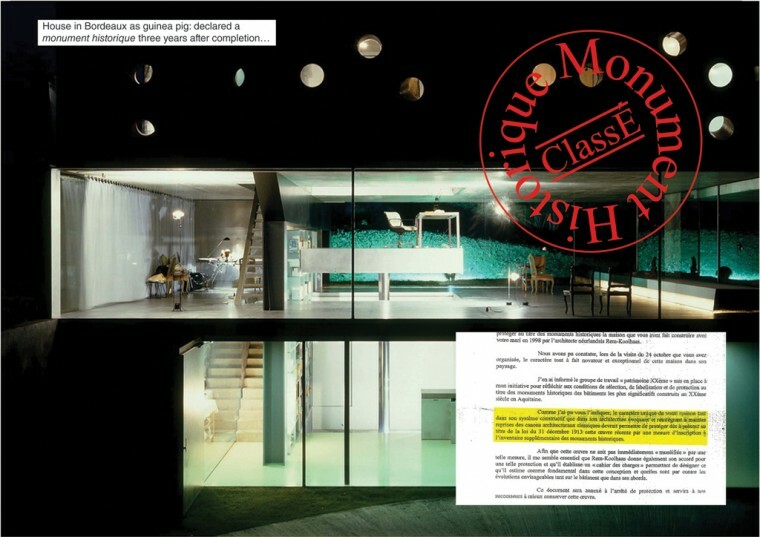 Beatriz Ramo interviewed Ippolito Pestellini from OMA on behalf of MONU magazine. The interview took place at the Urban Espresso Bar in Rotterdam. Projects by Barragan, Le Corbusier, Gaudi, Mies, Niemeyer, Utzon, and Wright, are included in the UNESCO World Heritage List and/or waiting on the Tentative List. Brasilia by Oscar Niemeyer and the Sydney Opera House by Jørn Utzon were included while the architects were still alive; both architects, along with Luis Barragan, are Pritzker Prize laureates. Rem Koolhaas is also a Pritzker Prize winner and, given the relevance of his contributions to architecture and the city, it seems inevitable that projects by OMA will be inscribed as World Heritage Sites in the very near future. In the meantime, at least three of their buildings were or are at some point on the road towards demolition: The Bus Terminal, Rotterdam, 1985 – demolished 2003; Museumpark, Rotterdam, 1994 – partially demolished 2006; and the Dance Theater, The Hague, 1987 – expected to be demolished in 2012. While the Netherlands seems to have a very pragmatic un-nostalgic view of the works of Rem Koolhaas, France rushed to protect the Maison À Bordeaux in 2001 only 3 years after completion. OMA has been involved directly with preservation issues in more than 20 projects; at least three of those were located within UNESCO World Heritage Sites: the Hermitage Museum in Saint Petersburg (ongoing), the Masterplan and Kohlenwäsche at Zeche Zollverein in Essen, Germany (2002 and 2006 respectively) and the Fondaco dei Tedeschi in Venice, in which Rem Koolhaas and team leader Ippolito Pestellini Laparelli are currently involved. Recently, OMA examined the implications of preservation for their projects in the exhibition CRONOCAOS at the Venice Biennale in 2010. The interview will deal with the direct and indirect implications of preservation and demolition with regard to the work of OMA. Beatriz Ramo: In France they listed the House in Bordeaux as a Monument three years after its construction. Was this the right decision? Ippolito Pestellini: Rem was quite interested in it. The building was declared a National Monument at the same time that Rem was asked to rethink the concept of the house because the owner had passed away. It felt like a paradox…not being able to change his own work after such a short time. I wouldn’t say that Rem looked at this negatively, but rather as a point of discussion and he found it very weird. This made us think about the age of buildings designated for preservation. BR: How important was, for this designation, the fact that Rem Koolhaas was the designer? BR: However it was the same architect to undertake the renovation, so very likely the result would have been as successful… Can’t owners reject the preservation of their own house? BR: OMA took part in the competition for the New Dance Theater in The Hague. Your proposal did not maintain any part of the existing building designed by OMA around 35 years ago. Do you think that it doesn’t deserve to be partially or totally maintained? BR: Suppose you have to choose one of your buildings to protect in order to ensure that it will not be changed or demolished, or simply because it is in danger. Which project would it be? IP: I don’t know if there are any in danger… And uh, [laughter] which one would be preserved…? If you put the projects in a bigger historical perspective maybe the one I would choose is the CCTV building because it belongs to a specific era of modernization in China as it contributed to push CCTV, the ultimate propaganda tool of the Chinese communist party, to open up to global content; for example to broadcast in English. And it happened with the development of the project. So for historical relevancy and political interest I would say that one. BR: At the moment you are working on the Fondaco dei Tedeschi in Venice. This area is also listed as a WHS by UNESCO. What has been your biggest challenge with regard to preservation issues? BR: In general, what would be your biggest critique of the policies of UNESCO? IP: Definitely the non-ability to mediate between transformation and preservation. What they do is extremely difficult, but the objectiveness of the criteria for listing sites as WHS is definitely a problem. (…)The criteria became increasingly vague as more countries joined the UNESCO convention, from 1972 on. There is a kind of fever of preserving, but then forgetting to preserve very relevant things like the post war architecture, for example, or the many buildings of Nazi-Fascist regimes which of course are very important for our history; but just because of this political past, which is extremely uncomfortable to relate to, they are cut out. So the objectiveness is really an issue. BR: It seems like Hitler and Mussolini are still a very recent figures. But if you think about some absolutist kings or someone like Napoleon, who belong to a much older past, people do not have any problem to preserve Versailles or the Empire Style in architecture… Nevertheless there are several examples of Nazi architecture in the UNESCO list. IP: Yeah, but many more have been destroyed. And this also happened in Italy, with Fascism, even though they were architecturally extremely clever. The history of Haus der Kunst in Munich, which we exposed in the Biennale through the reuse of furniture, is super interesting. It was built to be a propaganda machine for Hitler in Munich, and after the war, instead of dismantling it, they tore off all of the interiors and turned it into a white box condition, storing away all the door handles and the furniture in order to virtually erase the Nazi past, but the building stays there. So this is a very paradoxical situation.